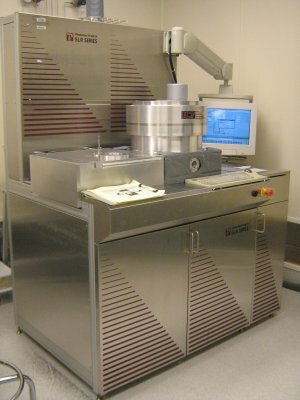 The Plasmatherm deep reactive ion etching tool is a silicon etching tool capable of ~2 microns/min etch rates (depending on loading) in silicon using a Bosch process. The tool has process gases including SF6, C4F8, O2, and Ar. Silicon, photoresist, SiNx, and SiO2 are allowed in the chamber, but no metals are allowed. Tooling is configured for a 4-inch wafer.